Won’t Last Long! Free $45 to $90 in CVS Credit For Buying PayPal Prepaid Cards at CVS! Update: According to the CVS Facebook page, this deal will be honored at all stores up to the end of Wednesday, November 27, 2013. If you live in New York, Illinois, Nevada, Oklahoma, Vermont, Wisconsin or Hawaii, you can’t buy the PayPal Prepaid card, but can buy a MyVanilla or NetSpend card and get $50 Extra Bucks. 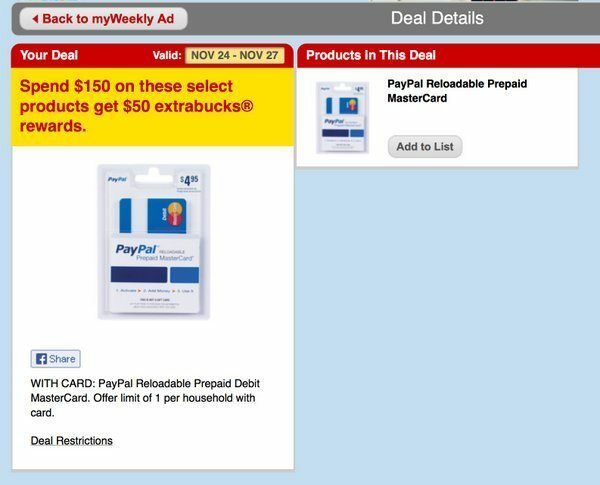 Via Slick Deals, you can get $50 in CVS store credit (in the form of CVS Extra Bucks) if you buy a PayPal Debit MasterCard and load it with at least $150 at CVS. You can use this PayPal MasterCard just like a regular card for shopping or you can cash it out. Get ~$45 in CVS Credit with a $150 PayPal Prepaid MasterCard! This is only valid from November 24, 2013 to November 27, 2013, so hurry! So you’ve effectively got~ $45 worth of free stuff at CVS after accounting for the $5 fee to buy the PayPal Prepaid MasterCard! This deal is dying quickly as CVS stores are running out of PayPal MasterCard Prepaid cards. The first CVS we tried had run out of the PayPal MasterCards, but the teller told us the specific address of another CVS which still had the cards! See this picture of the in-store promotion from SlickDeals. Check online via this link to see if your local CVS has the promotion running to get $50 off the PayPal Debit Master card. Hit “Control” and the “F” key, and then enter in $50 to search for “$50” to find the promotion quickly! Buy one PayPal Prepaid MasterCard and ask the cashier to load it with $150 with a credit card at CVS. 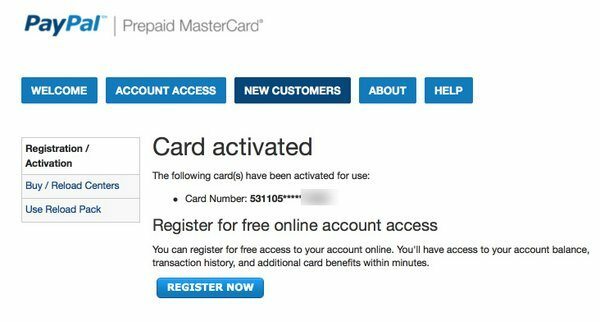 There is a $5 fee for buying the PayPal Prepaid MasterCard. 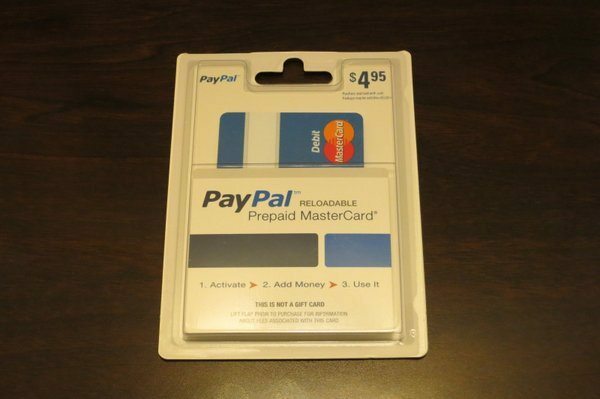 Here’s what a PayPal Prepaid MasterCard looks like. 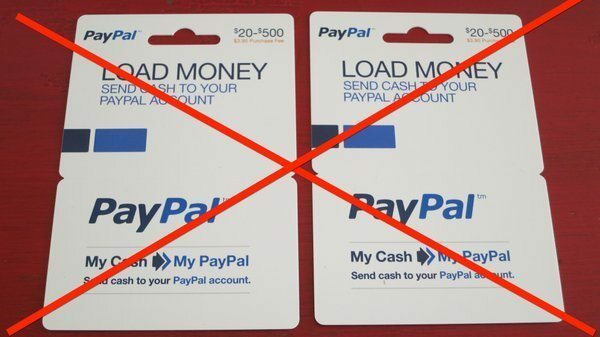 Do NOT buy the PayPal RELOAD card which looks like this. Be sure to have the teller scan your CVS Extra Care card when you make the purchase. You won’t get the $50 Extra Bucks if you don’t scan your Extra Care card at check-out! 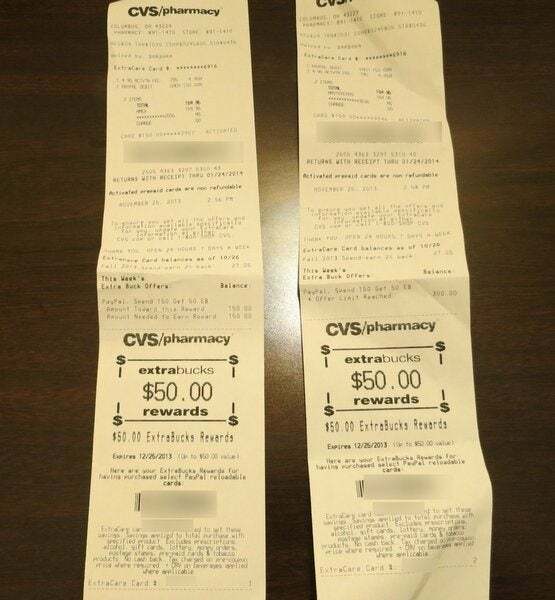 You will get $50 Extra Bucks on your receipt which you can use at CVS for most purchases ~1 month. 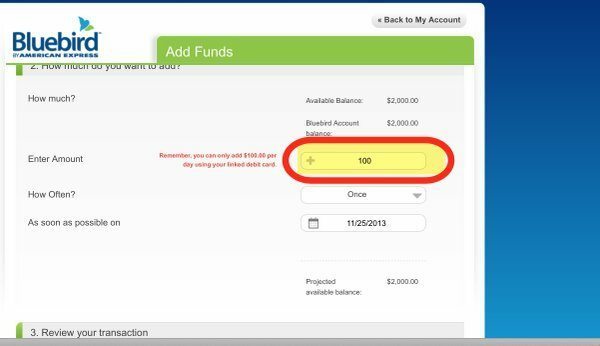 You may be able to buy a 2nd PayPal Prepaid MasterCard and get another $50 in Extra Bucks. Note that you CANNOT buy 2 PayPal debit cards at the same time and HAVE to break them into separate transactions to get the $50 Extra Care bucks. 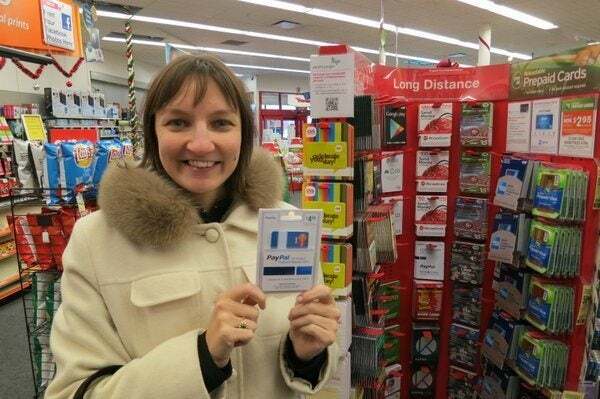 I Was Able to Buy 2 PayPal Prepaid Cards & Get the $50 in CVS Credit for Each Transaction! The terms of the ad online say that you are allowed only 1 MasterCard debit card, but I was able to get the $50 for 2 separate purchases. The cashier was skeptical that I’d get the $50 Extra Bucks again, but I told her I wanted the PayPal Debit Card as a gift, so it wouldn’t matter if I got the 2nd $50 or not. So she processed the transaction and I got the $50 in Extra Bucks! I registered our cards online at PayPal. This is MUCH quicker than calling to register your cards. You have to provide your social security number and address when you register the card online, but it was worth the convenience of registering online. As always, do what you’re comfortable with. However, you can only register 3 PayPal Debit MasterCards to each person. Folks on SlickDeals report being charged a 2nd $5 fee, which can be avoided by draining the card within a few hours of purchase (not activation). Even if you pay the $5 fee twice, you’re still coming out ahead with ~$40 in stuff from CVS, so I wouldn’t worry about it too much. But what do you do with the $150 on your PayPal Prepaid MasterCard? Use your PayPal Prepaid MasterCard to purchase items or make payments which you otherwise were going to make. 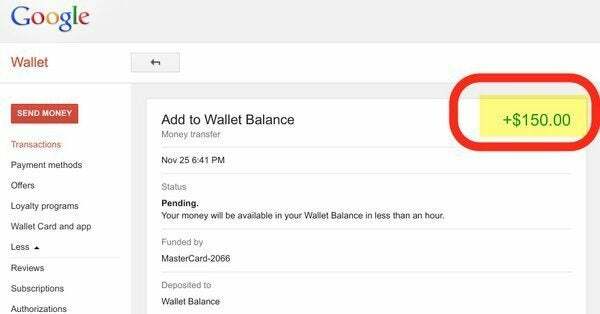 You can load your Google Wallet with up to $250 for free with a Prepaid card. And then transfer the money to your linked checking account or to a friend or family member. You can fund your Amazon Payments account with the PayPal Prepaid MasterCard and then transfer the money to your friend or family member for free (up to $1,000 per month). Amazon Payments is cracking down on folks who routinely transfer funds from 1 account to another account, so be careful. You can load up to $100 per day to your American Express Bluebird account online with no fee. So you could transfer the balance to your Bluebird account and then use your Bluebird account to pay bills etc. You can load up to $1,000 per day to your Bluebird account at Wal-Mart, so you could load your Bluebird if you’re at Wal-Mart. You can withdraw money from the ATM for a $1.95 fee, in addition to the fee charged but the ATM owner, after setting a PIN when you activate the card online. Once you activate the card and select a PIN, you should be able to use it to buy Money Orders at Wal-Mart or at certain grocery stores. You can get cash back at stores with the PayPal Prepaid MasterCard, so you could buy something small at a store and select to get cash back! Sign-up for a free CVS Extra Bucks account at the CVS store. Also note that you have to use the FULL amount of your Extra Care Bucks in one transaction because you won’t get a refund of the difference. For example, if you buy $40 worth of goods with a $50 Extra Care Bucks coupon, you will NOT get $10 back. Also note that CVS will frequently mail 20% off coupons, which you can stack with your Extra Bucks for even more discounts! You can get $40 to $45 worth of free stuff at CVS for buying a $150 PayPal Prepaid Mastercard at CVS. Once you activate the PayPal Prepaid MasterCard online, you can use it for regular purchases or to fund your Bluebird account. 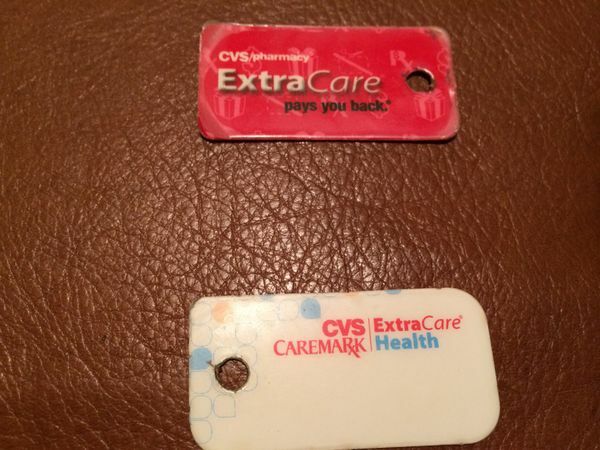 You may be able to get up to 2 Pay Pal Prepaid MasterCards, but make sure to buy them 1-at-a time at CVS with your CVS ExtraCare card. I’ve tried to load my Paypal mastercard and visa gift cards onto my Bluebird card at Wal-mart. It was not allowed. So I called customer service and they said that the policy changed and from now on, only Vanilla Reload cards can be used to load the Bluebird card (as well as cash and bank accounts). Have you heard this? If this is true, manufactured spending is no longer an option to meet spending requirements! How can I get around this?? Jet Blue is #1 airline because of free inflight TV! 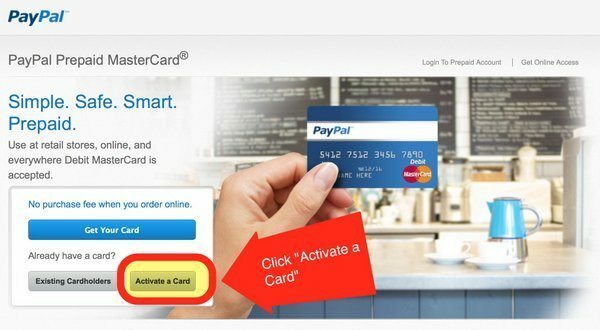 no way you can fund your Amazon Payments account with this paypal prepaid card!!!! @garrett johnson-i got the same message on my third paypal bluebird load. i got a phone call saying that i can’t load with a prepaid card but i can with a vanilla reload. i said no this is a debit card, also why is vanilla reload acceptable, isnt’ that a prepaid card? asinine answers is what you’ll get. she couldn’t answer me but made up some bs.